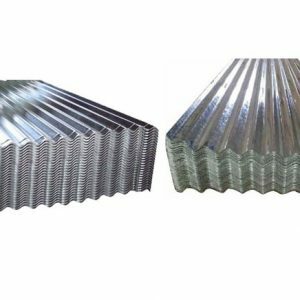 Corrugated galvanized metal sheet are a lightweight roofing material made of thin sheets of iron or steel which is stiffened by waves-like corrugations. These corrugations considerably increase the strength and stiffness of the lightweight material. The corrugated iron sheets are galvanized or coated with zinc to make them resistant to weathering and rust. Corrugated GI (CGI) sheets find uses in every sector of the economy from agricultural to industrial and constructional activities. Galvanized iron (GI) corrugated sheets have become a popular and widely used material for residential roofing projects in the UAE. Although corrugated metal sheets are available in other metals options like aluminum and copper, GI corrugated sheets are more in demand as they are an inexpensive option. GI corrugated sheets come in varying thickness and specifications and can be obtained from local suppliers and dealers of roofing materials in the UAE. Pre-painted galvanized steel sheets are also available and are a cost-effective and durable product, mostly used in applications which include roof and wall panels for non-residential buildings. GI corrugated sheets are available in a variety of options which allows for customization based on the style, thickness, color and price that you wish to obtain. Large surfaces can be covered per sheet which can result in material and cost savings for the support structure and savings in installation time. They are lightweight in nature and therefore reduce the load on building structures. GI corrugated sheets are recyclable making it an environment-friendly option and a suitable material for green projects. They reflect solar heat thus helping to save on cooling costs and in minimizing energy consumption. One of the main advantages is that CGI can be installed on the existing roof, helping to save on time and dismantling costs. Corrugated GI sheets are treated with chemicals and this makes them resistant to rust, mold and algae which are three very common problems usually associated with roofing materials. The quality of CGI sheets in the market can vary greatly. It is therefore necessary to procure CGI sheets from reputed dealers who are fully experienced on the effects of the performance of these sheets and how well suited they are for that particular requirement. Burhani Oasis based in Dubai, UAE has a comprehensive range of corrugated galvanized metal sheets of varying sizes, thickness and rates. Backed by experienced knowledgeable staff, we are fully prepared to meet your CGI requirements no matter the size or nature of your project. Burhani Oasis is the no:1 supplier of Galvanized Iron Corrugated Sheet in UAE. Contact us today to know more about how we can help you meet your requirements. Galvanized Iron Corrugated Sheet are available in Dubai, Sharjah, Abu Dhabi, Ajman, Fujairah, Ras Al Khaimah, Umm Al Quwain, across UAE.